The Six - the cursed pistols that can destroy the world - have fallen into the wrong hands. Griselda the Grey Witch and her henchman Jesup Sutter now control the weapons. As they prepare to use the guns to throw open the gates of Perdition and condemn the world to darkness, they ... read full description below. The Six - the cursed pistols that can destroy the world - have fallen into the wrong hands. Griselda the Grey Witch and her henchman Jesup Sutter now control the weapons. As they prepare to use the guns to throw open the gates of Perdition and condemn the world to darkness, they are opposed only by a ragtag group of desperate heroes. But Drake Sinclair, Becky Montcrief, and Screaming Crow have a few surprises in store for the ageless witch. As the apocalypse dawns, a vicious gunfight rages in the streets of a nameless city! CULLEN BUNN is the writer of comic books such THE SIXTH GUN, SHADOW ROADS, THE DAMNED, HELHEIM, and THE TOOTH for Oni Press. He has also written titles including HARROW COUNTY (Dark Horse), UNCANNY X-MEN, and DEADPOOL AND THE MERCS FOR MONEY (Marvel). Cullen claims to have worked as an Alien Autopsy Specialist, Rodeo Clown, Pro Wrestling Manager, and Sasquatch Wrangler. He has fought for his life against mountain lions and performed on stage as the World's Youngest Hypnotist. Buy him a drink sometime, and he'll tell you all about it. Brian Hurtt is an artist/writer who has spent most of his career working on collaborative creator-owned projects. His first such collaboration was in 2006 when Brian teamed with writer Cullen Bunn to create the Prohibition-era, monster-noir, cult classic, The Damned. 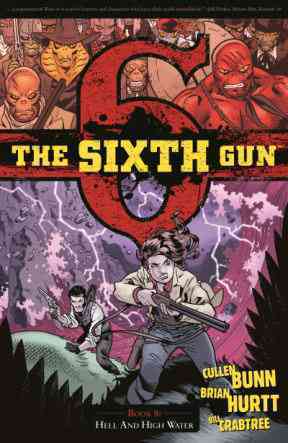 A few years later the two teamed up again to create The Sixth Gun--a weird-west, epic supernatural fantasy. Spun out of that world, they're now collaborating on Shadow Roads. Brian also contributes to the popular webcomic Table Titans, in which he is the writer and artist of the stories Whispers of Dragons and Road to Embers. Brian lives and works in St. Louis, Missouri. Bill Crabtree's career as a colorist began in 2003 with the launch of Image Comics' Invincible and Firebreather. He was nominated for a Harvey Award for his work on Invincible, and he went on to color the first 50 issues of what would become a flagship Image Comics title. He continues to color Firebreather, which was recently made into a feature film on Cartoon Network, Godland, and Jack Staff. Perhaps the highlight of his comics career, his role as colorist on Oni Press' The Sixth Gun began with issue 6, and has since been described as like Christmas morning, but with guns.